OMG his muscles ripped through his shirt. The plot sounded too awesome to resist: somewhere in the Himalayas, a happy-go-lucky man-child encounters aliens and is given super strength and super intelligence. Hrithik Roshan, the ultimate pretty boy of Bollywood, stretches some acting muscles in the title role. We get a big fat view of his third thumb. Even Rekha is in it! Damn, but Hrithik is a fine dancer. Koi... Mil Gaya (I Found... Someone), like Rakesh Roshan's previously PPCCed film, Koyla, is entertaining enough, though also a little superficial, a little trashy. 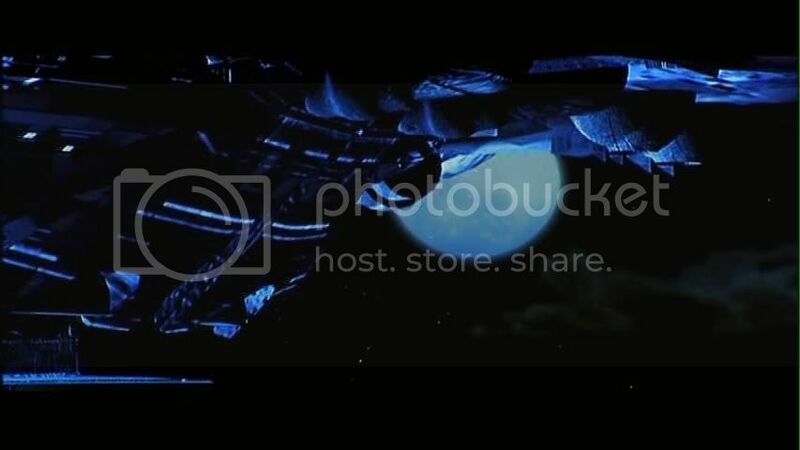 The influence of Hollywood blockbusters is heavy, and once again, as in Koyla, we have snatches of Hollywood soundtracks: in KMG, music from Lord of the Rings can be heard as characters first comes upon the spaceship. The second half of the plot follows E.T. very closely, and there are some visual homages as well: for example, Rohit bicycling through the forest with the alien sitting in the basket. Roshan also mimics Star Wars. The plot: back in the day, Rohit's Dad (played by Hrithik's Dad, Rakesh Roshan) used to play Om Om Om Om on a child's keyboard and beam that music into space. Aliens responded and yet no reputable scientist believed Rohit's Dad. One evening, Rohit's Dad and Rohit's Mom (Rekha) are driving along and, stunned by the lights from an alien spaceship or something, get into a crazy car accident. Rohit's Dad is killed, and Rohit's Mom suffers an injury to the abdomen, hence explaining Rohit's mental disability. Fast forward thirty years, and an adult Rohit is struggling to pass sixth grade. Affectionate, wide-eyed and innocent, he is the archetypal man-child, towering above his much younger friends. 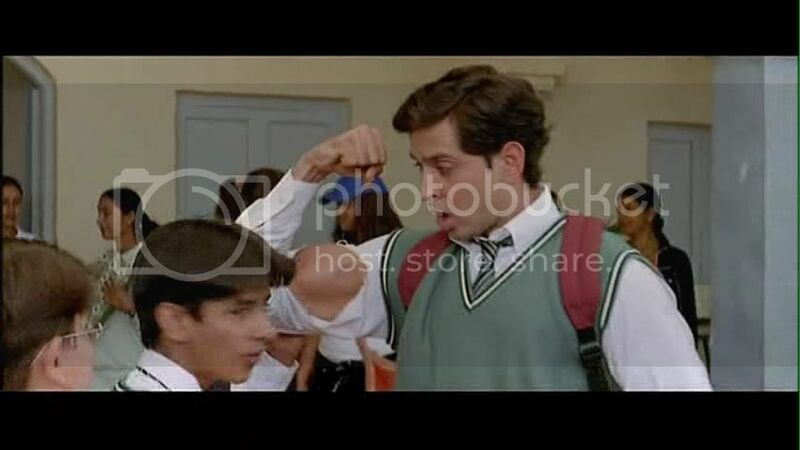 His arch-enemy is the bully, Raj (Rajat Bedi), an idiotic muscle man who picks on people with disabilities. His love interest, after some confusion and a few songs, is Nisha (Preity Zinta). 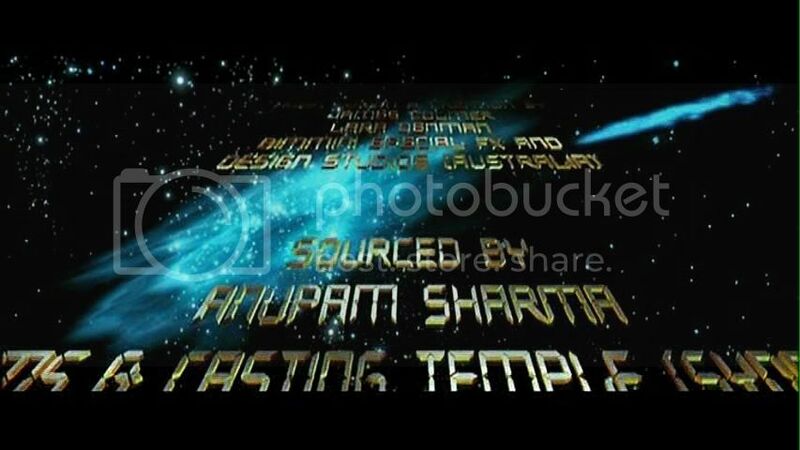 One day, Nisha and Rohit are messing around with his father's computer and they accidentally beam the Om song into space again. The aliens respond and, after wreaking havoc on the Himalayan power supply, accidentally abandon one of their own (a la E.T.). Unfortunately, Jaddoo the Alien, as he is called, cannot phone home and so tries to make friends. He is soon revealed to have super healing abilities and, after healing Rohit's scratched arm, he notices that Rohit's got bigger problems - namely, the cruel teasing of his disability. Jaddoo helpfully fills Rohit's muscles with super strength and Rohit's brain with super smarts. Rohit is pleased. But unfortunately evil scientists are coming to get Jaddoo, and so Rohit must call back the mothership for a pick-up. Much sadness ensues, but there is promise that Rohit's super abilities may yet remain for a sequel. Say what you will, but Hrithik is impressive in this, if only for the choice of role. For an industry that seems to encourage it's superstars to shy away from non-conventional roles (we're talking about you, SRK), Hrithik has thrown himself all three thumbs into this role. He even has a characteristic high-pitched laugh - I mean, for the love of God, he's developed a unique trait for the role! This is so refreshing after watching Amitabh's well-worn slyness and SRK's well-worn furrowed brow for the millionth time, endlessly repackaged into their stock characters: Vijay, Vijay, Vijay... Rahul, Rahul, Rahul... Oscar winner he may not be, but Hrithik still tries hard. Similarly, he seems fully aware of his almost comically pretty face, and he uses that to wonderful effect as well - passing himself off as the bright-eyed and bushy-tailed kid (something, again, that the Big B or the Badshaah could not do). Also, the PPCC must appreciate his fiery dancing skillz. I mean, damn. So lithe! So limber! Praise praise. Everyone else in the film plays to their stereotype, though interestingly director Roshan manages to pull out some of Johnny Lever's humanism again. Preity Zinta has little to do, and she likewise shies away from the obvious hairy bits of her character: namely, does Nisha like Rohit for real or is she pitying/patronizing him? We don't know, because Preity shows us no conflict - she's all diplomatic smiles. Rekha seems more woeful and aging than she should be, though we suppose she was never really very upbeat. 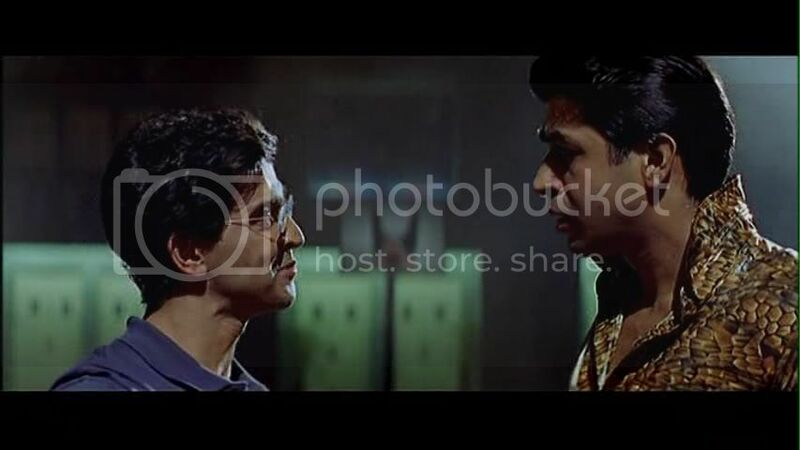 Rajat Bedi as Raj was despicably villainous; we had no Pran-like love for him. Even aliens drink Coca Cola. The songs were generally forgettable, apart from Hrithik's phemonemal dancing skills, with the exception of Idhar Chala Main Udhar Chala. But we always love magical realism in dance, especially when dancers can lean to improbable angles. In fact, the song is much like a cross between Gene Kelly's Singing in the Rain and Justin Timberlake's Cry Me a River. It's also a bit like Namak Halal's Aaj Rapat, which, yes, is the sexiest song evarr. Funny, I've just been watching this myself, and though it will be a while till I write it up (big backlog at the moment) my thoughts are similar to yours. In particular, while Hrithik's performance is not one for the ages, he gets an A for effort (especially given the limitations of the script). It's a cute enough film. I too find KMG enjoyably cute. I am dying to know how his portrayal of developmental challenges was received. Realistic? Evocative? Mocking? I have no idea. When I first watched this, he struck me as cartoon-like, but seen in the broader context of his other roles and of other people's other roles, I think you've got a good point.